2015 Subaru Outback Pros and Cons: Why (Not) This Car? Many European manufacturers followed Subaru's lead. Volvo developed an XC (Cross Country) version of the V70, and stopped offering the conventional wagon here a few years ago. The V60 just got a Cross Country variant. Audi no longer offers an Avant wagon in North America. Instead, we get the allroad. VW will introduce an Alltrack variant of its Golf Sportwagen later this year, so that model's days as a conventional wagon could also be numbered. The Subaru that started it all was redesigned for the 2015 model year, and is selling better than ever. What about the Outback has made it not only very successful, but emulated by many esteemed European auto makers? Why do so many people want this car, while eschewing conventional wagons? I spent a week with one to try to find out. Given the lack of direct competitors for the Outback, especially in cloth four-cylinder form--the European emulators are all much more expesive and more powerful, the Golf SportWagen is smaller and not offered with all-wheel-drive--I wasn't sure what to compare it to. So I asked members. The most common response: the Jeep Cherokee, an SUV. The two models are priced about the same, both are offered with non-turbo four-cylinder engines, and both cultivate an outdoorsy image, so this makes at least as much sense as any other comparison. Game on. Better materials than past Outbacks. Silver plastic trim nearly passes for aluminum. Why the 2015 Subaru Outback? The Outback's top strength isn't listed here: if you are among the remaining, apparently few people who want a midsize station wagon that costs less than $30,000, you have no other option. This aside, the Subaru Outback has so many strengths that I struggled to narrow them down to five, and then to decide which of the five deserved to be listed first. Subaru isn't among the largest car companies. Yet it has managed to engineer cars that, since 2010, have earned top crash test scores, and that since 2013 have featured the best crash prevention technology you'll find in cars that list for less than $30,000. You'll find similar technology elsewhere, but most often in expensive luxury cars, and if in something without a fancy badge then only with the top level trim. On the Cherokee, you can get blind spot warning with the midrange Latitude, but must spring for the much more expensive Limited or Trailhawk to get a Technology Package that includes the others. In constrast, Subaru offers its Eyesight package--forward collision alert, effective automatic braking, lane departure warning, and blind spot warning with rear cross-traffic detection, plus adaptive cruise control and a power liftgate--for a very reasonable $1,695 on all but the lowest trim level. And a rearview camera? One is standard even on the base model. The Jeep's safety scores are nearly as good as the Subaru's, the main exception being an auto-braking system that was only partially effective in the IIHS's high-speed test. The Cherokee hasn't been subjected yet to the difficult small overlap test, where the Outback earned a good score. 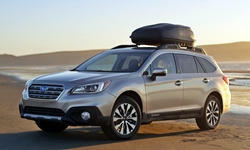 Subaru has also made impressive strides recently in improving fuel economy. Through 2009 the EPA rated the Outback for 20 mpg city, 26 mpg highway. Though the Outback grew substantially for 2010, it also gained a continuously variable transmission (CVT), and this boosted the ratings to 22/29. A new engine for 2013 affected another increase, to 24/30. Tweaks for 2015 yielded the most recent bump, to 25/33. Nearly every gasoline-powered crossover close to the Outback in size with all-wheel drive falls short, even well short, of these ratings. The Jeep Cherokee, despite a nine-speed transmission, manages only 21/28. The only one that matches the Outback's ratings is the new Honda CR-V (with a slightly better 26/33). My entire week with the Outback was spent with the air temperature below, usually far below, freezing. With a cold start, fuel economy was about 15 mpg for the first two miles. But once the engine warmed up, it managed trip computer averages between 22 and 30 mpg in my suburban driving, and most often about 25, right on the EPA city rating. On a 70-mph highway I observed 30 mpg in one direction but 26 mpg in the other. To match the EPA highway rating in the real world you'll need to drive more slowly. Warmer temperatures should also help. Hiking up its skirts for some deep snow. Shot borrowed from my Legacy review, hence the subpar nav. Most other controls are well-designed. Some compact crossovers roughtly match the Subaru Outback's cargo volume specs: 35.5 cubic feet with the second-row seat up and 73.3 cubic feet with it folded. But, with its station wagon proportions, the Outback has a longer cargo floor--nearly 6.5 feet--so it's more useful for people who only pack to the base of the windows. The Cherokee, with an unusually tight cargo area, doesn't come close, with specs of 24.8 and 54.9 cubic feet, respectively. The Jeep does have one advantage, though: its front passenger seat also folds to extend the floor for especially long cargo. Through the 2009 model year, the Outback (and the related Legacy sedan) had a tight back seat. Though marketed as a midsize car, it was actually a compact. The 2010 redesign dramatically expanded the Outback's interior, especially in the back seat. The 2015 redesign added another inch of shoulder room, such that the Outback (and Legacy) are now not only truly midsize, but rank among the roomiest midsize cars. Rear air vents are offered--in Outbacks with leather. So the tested car lacked them. Some compact crossovers, including the Cherokee, are about as roomy, but they achieve their specs through a more upright seating position. People in the back seat are closer to the front seats, so they don't feel like they have as much room even though they have just as much space for their legs. But they get rear air vents even in the lower trim levels. Judging from the appearance (I hesitate to use "styling") of its cars, Subaru remains a company where the engineers decide the basic shape of the body, while the designers make do with what they are handed. Like other Subarus, the Outback retains unfashionably large, upright windows. You'll be hard-pressed to find a car that's easier to see out of. Yet while the seats are nearly crossover-high, the seating position is relatively stretched out, more car than crossover. This combination should appeal to people who prefer the less upright seating position of a car, but who also want the outward visibility of a crossover. With a taller, deeper instrument panel and smaller windows, the Jeep is not as easy to see out of. Why Not the 2015 Subaru Outback? My week with the Subaru Outback included one big surprise: it doesn't ride well. This was a surprise because ride quality was among the reasons I listed for buying the related Legacy sedan. While the Legacy's ride feels cushy yet controlled, the Outback's feels firm and jumpy. The midrange Outback's 225/65R17 tires are quite tall by current standards, and are much taller than those of the Legacy 3.6R's 225/50R18 tires, yet they seem to do little to absorb impacts. What happened? Well, to make a Legacy into an Outback Subaru raises the suspension about three inches (ground clearance increases from 5.9 to 8.7 inches), and vehicles with a higher center of gravity must either lean more in turns or ride more firmly. Subaru appears to have opted for the latter. A firm suspension is also less likely to bottom out in the moderate off-road use the Outback has been designed to handle. This said, I don't usually mind a firm ride. What I mind is a busy one, and the Outback's suspension reacts to Michigan's pockmarked streets with overly frequent, overly sharp upward kicks, fore-aft rocking, and lateral head-tosses. The Jeep's suspension might permit a little more roll, but in exchange it absorbs initial impacts better and feels much more composed. The Outback is fairly quiet inside, especially compared to past Subarus, but the Cherokee is even quieter. The front seats have an unusually high bulge just below my shoulder blades. This feels more odd than uncomfortable, at least to me. The driver's lumbar adjusts, but this affects the area below said bulge. Partly depending on your height your experience might vary. These seats also provide very little lateral support, which admittedly isn't much of an issue given the non-sporting character (and non-sporting tires) of the Outback. I had no such qualms with the armrest on the door. It's wide and cushy. In the front seats' favor, for 2015 Subaru has added fore-aft adjustability to the headrests, a rarity in recent moderately priced cars. The Jeep's cloth seats are too squishy, but they're more form-fittting than the Subaru's, and I find them more comfortable. A high ground clearance, cladding, and big round fog lamps announce that this is no mere Legacy. Very roomy, reclinable rear seat. But if you want rear air vents you must step up to the Limited. The 2005-2009 Legacy and Outback were the most stylish four-door cars to ever wear the Subaru badge (if perhaps a bit generic). The 2010 and on...well, remember the part about engineers calling the shots at Subaru? Then again, you might think like an engineer and find the car's functionality beautiful. Subaru scores big points for safety features and all-wheel-drive. But a few desirable features offered on the Cherokee aren't available with the Outback: heated steering wheel, cooled front seats, auto-dimming headlights, rain-sensing wipers, obstacle detection, and an active parking system. Then again, you might not want any of these features enough to pay for them. I dinged the Legacy for its controls, but the tested top-of-the-line car had Subaru's navigation system. The tested midrange Outback did not, and I liked its controls better. Still, the touchscreen's virtual controls can be hard to tap while driving on a Michigan road. Plus I could not reach the tuning knob without leaning forward. Despite automatic climate control the blower starts doing its thing when the car is first started. Most such systems hold off on cold days until they have warm air to provide. Materials are better than in past Subarus, and compare well to others in this price range. If you want a fairly quick (if still short of thrilling) Outback, opt for the 256-horsepower, six-cylinder 3.6R. The 175-horsepower 2.5-liter four-cylinder engine in the tested Outback 2.5i Premium performs adequately, but never feels quick. The Cherokee is a few hundred pounds heavier, and is more sluggish as a result, but at least Jeep has muffled its harder-working engine better. In the past Subaru offered the Outback with a manual transmission. For 2015, your only option is a CVT that can be manually shifted among six fixed ratios if you so desire (I generaly didn't). To mollify those who dislike the "slipping" feel of a conventional CVT, Subaru's latest is programmed to loosely mimic a close-ratio stepped gear transmission: let revs climb slowly, drop them back a few hundred, repeat. With the six-cylinder engine this mimicry is so convincing that I drove the new Legacy 3.6R for a few days without realizing it had a CVT. It's much less convincing with the four-cylinder engine, largely because the smaller engine makes less pleasant noises in greater volume. A deal-killer? For some people, perhaps. But these same people will probably want the additional performance of the 3.6R anyway. Subaru is most renowned for the traction and control provided by its all-wheel-drive (AWD) systems. Unlike many others, including that in the Cherokee, the Outback's AWD continuously powers both axles. If additional traction is needed to get moving, a button engages X-Mode, which modifies the transmission and brake-based traction control programming. I found this mode effective--up to a point. Ultimately, the Outback's traction is limited by that of the stock all-season tires. If you really need good traction in deep snow, you need true winter tires (which will also vastly improve cornering and braking on ice). And if you want to head off the road? Then the Cherokee--in Trailhawk form--has a clear edge. The Outback has a solid body structure, competitive ground clearance, and sophisticated chassis electronics, but it's not designed to master the Rubicon Trail. Unpaved roads with ruts and the occasional stray rock are more its thing. The Outback handles more like a car than the typical crossover, so I initially considered listing handling among the reasons to buy one. But it handles less like a car than, well, a car. Compared to the Legacy it feels oddly high, and as if it might get tippy in corners. I'd personally still prefer a Legacy wagon. Not that the Outback actually does get tippy in corners. Instead, when pressed the Outback actually feels more in its element and manages corners with good balance and moderate roll. The stiff springs and dampers aren't without benefits. Compared to the Jeep's, the Outback's steering and suspension feel more communicative and more agile, and thus more confidence-inspiring, if still well short of sporty. Most people would assume that the Outback will also prove far more reliable than the Cherokee (a Jeep with Fiat roots), and buy the Subaru for this reason. But they're about even in our reliability stats so far--both are good but not great--and some owners of 2011-2013 Subarus with this four-cylinder engine have been reporting excessive oil consumption. Odds based on the past history of Subarus and Jeeps still favor the Outback, but I'll withhold judgment for at least another year or two. I also initially planned to include price among the reasons to buy a Subaru Outback. But while the tested Outback's $29,540 list price undercuts a similarly equipped Cherokee by about $1,400, demand has been outstripping supply, so the Jeep is likely less expensive after factory incentives and dealer discounts. Even with little or no discount the Subaru's price is reasonable. But those who expect the dealer to deal will probably be disappointed. Also worth noting: the Outback lists for $4,055 more than a similarly equipped Legacy sedan. Outback-specific bits (including the lower body cladding, fog lights, deep-tinted rear windows, X-Mode, power liftgate, reclining rear seat, roof rack, and rear wiper) account for a little more than half of this difference. The other $1,800 can be chalked up to the "SUV premium." Put another way: a Legacy wagon, if still offered, would likely cost about $2,000 less, leading me to prefer this withheld alternative even more. With the Outback, Subaru has successfully combined the interior functionality and car-like handling of a wagon with the winter traction and imagery of an SUV. The resulting car isn't thrilling to look at or to drive, but this isn't its mission. Safe, fuel-efficient, and roomy with all-wheel-drive traction and a reasonable price--it's not hard to see why Subaru dealers are struggling to keep Outbacks in stock. I didn't care for the car's ride or its front seats, but your roads could be smoother and the seats could fit you better. The Jeep Cherokee cannot hold nearly as much cargo (the Subaru's wagon-like proportions pay big dividends here), it doesn't offer all of its safety options on the mid-level trim, and it doesn't handle as well as the Outback, but it rides more smoothly and quietly and offers more luxury features (if you're willing to pay for them). I'm not a fan of its styling, either, but at least Jeep's designers appear to have had a say in the matter, and more than a few people seem to find the result attractive. I'd prefer a Legacy wagon to either of them. But since Subaru can sell every Outback it can make despite charging thousands more for it, I don't expect the Legacy wagon to return to North America any time soon. Flat four performs adequately and efficiently. Need more power? Then get the six. Subaru provided an insured Outback for a week with a tank of gas. Michael Williams of Southfield (MI) Jeep provided a 2015 Cherokee so I could drive the two vehicles back-to-back. Always helpful, he can be reached at 248-354-2950. 2015 Subaru Outback pros and cons, according to Michael Karesh: the best reasons for buying (or not buying) the 2015 Subaru Outback. Join TrueDelta to post your own impressions. good review of the outback. There is a lawsuit regarding the excessive oil consumption of their forester. I've read a number of complaints about the company's stonewalling over this issue. Their spin is that the consumption is within normal range but the complaints say otherwise. Subaru, like most OEMs, defines "normal" as anything over 1,000 miles between quarts. Most owners, on the other hand, tend to see anything over a quart per 3,000 miles as excessive. Big difference of opinion here. That may be but I am not aware of any other manufacturer being sued over this issue. Good review Michael. I'd love to see you get your hands on a Crosstrek. There are a large number of "common problem" class action lawsuits out there, party because some law firms specialize in these. Honda even has a reputation for being an easy mark, because they're the most willing to pay to protect their reputation. "This would leave Mercedes-Benz as the only manufacturer offering a conventional wagon in the United States." No. Last year I leased a 2014 BMW 3 series wagon (which BMW wants you to call a "sportwagon"). It's a pretty good car. Mine is a turbo diesel but they offer a gas turbo model, too. Roomy for a 3 series. My family of 4 travelled around Germany with our luggage after picking it up in Munich. I have a 2014 Outback that I've owned for 13 months. No oil consumption issues so far. I am very pleased with the car, except for one minor gripe: cold feet. In the 2014 (and my 2001 Outback) the "floor" vents for the heater hit me with warm air at mid calf, which then rises. My poor feet on the pedals stay cold for a long time! My other complaint with the 2014 had to do with option packaging. In 2014, if you wanted a rearview camera on your Premium model, it was bundled with the sunroof. I don't want a sunroof-- I need the extra headroom. (Fortunately, the wiring harness is there, and it was easy to add an aftermarket camera.) I gather the 2015 gives you a camera no matter what? Rcboater--the camera is standard, and you can get the package with all of the safety features without the sunroof. The tested car was so equipped. But if you want nav or the sunroof you're still getting both. In our stats, oil consumption is less common each model year from 2011 on. The question is whether the newer years simply aren't old enough yet. Honda has just lost an oil consumption lawsuit. People need to Google instead of saying, "I've never heard of anyone else suing over excessive oil use." These modern engines with slack piston rings and water for oil to reduce friction and boost mpg are all subject to excessive oil consumption if not broken in properly. Yet nobody seems to really know what ideal break-in actually is. A conundrum. The Outback amazes me. I have two acquaintances whose wives have decided, "That's it!" Conquests from Honda, for a frumpy mobile garden shed no less. Logic does not rule, but there's something about this beast that appeals broadly, so I know it's me who is out-of-the-loop. Being constantly at odds with popular opinion has been a failing of mine for decades, so I live with it. Truth be told, both Outback and Forester are just about impossible to find second hand around here. Just one Forester listed in a city of 400,000! That pretty much tells you these vehicles become part of the family, like a pet. I don't get it but a lot of happy owners do. I've driven a 2014 Forester as a loaner. To me, the interior is a plastic wasteland with no hope of owner's pride. Again, I'm wrong because it's only me - the Forester sells well. But the better Outback interior does help when wives' decide, which is finally a point I can agree on with the masses. And Subaru is raking in the coin these days. So what do I or any other detractor know? Obviously nothing of real importance. Honda didn't lose the suit, they settled it. Honda tends to be far more willing to settle these suits than other auto makers. They do this because it protects their reputation, but it also makes class action lawyers prefer them as a target. We have not had many reports of oil consumption in Hondas. We have had quite a few for 2011-2013 Subarus with the new four, the V6 used in the circa-2005 350Z and G37, and the 2.0T in a few 2009-2010 Audis. Can you tell us what you know about the why of the oil use problem? I think the oil problem involved the Forester not the Legacy. I agree with you about the value of the Legacy. The only criticism of the Legacy is that it's relatively slow. I have a '99 that we're pleased with. I don't know much about the oil consumption issue. It does mostly affect the Forester because it got the new engine first. The Legacy didn't get the new engine until two years later. Possibly insufficient sealing from the piston rings. They worked hard to boost mpg, and one way to do this is less ring tension. We purchased a 2015 Outback Premium2.5 two months ago and have been pleased with it so far. It is comfortable, roomier than we expected and handles well. We were able to get heated cloth seats and keep it to about $26k. Mileage is good with the 4 cyl engine but we also do not see the 33 estmiated hwy mpg. We average 28 on a 50/50 city hwy mix. For those of us who haven't bought a new car this century, the "radio" is a learning curve. Fortunately my kids figured out how to get Pandora on and how to change stations. Still haven't figured out the "voice commands" yet. While I cannot speak for the 2015 Outback, I can say that my 2015 Forester (with the same 2.5L NA engine) has not used any oil as of 15,000 miles, unlike the 2005 Outback that it replaced which apparently had a 2 cycle engine, a fact that I almost learned the hard way at about 3000 miles when I found the dipstick almost dry. I now check my oil at EVERY fill-up. Sorry if I regard "settling" a lawsuit the same as losing one. It tacitly admits guilt by offering the owner something, while somehow not admitting it - lawyers at their best, and commonsense nowhere. After they settled the V6 lawsuit, Honda also lengthened warranty on their 2.4 engines in Accord and CRV - you just have to jump through an oil use hoop test that is highly inconvenient, just like Subaru. All the usual suspects, Audi, BMW, Subaru and now Toyota on their 2.4 liter. One thing both the 3.6 Legacy and Outback lost for 2015 was the VTD AWD which had an actual center differential. If you can believe their website, the WRX CVT still has it. That'll be next to go, because the new Forester XT never had it. I've owned both the cheap AWD and VTD - the VTD is far superior on ice. Having owned Subarus for 20 years, I follow their fortunes closely, but frankly only the STI shows any sign of life to me, the rest have turned either into galumphers or like this test vehicle, firm and jolty, and with slow steering. Mazda cars beat them easily in the interior, steering, ride and handling department but don't offer AWD. And there's the rub after the north east coast winters we have had, so maybe it's a Mazda CUV next for me. Easier on the old joints to hop in and out, but performance chops, no. So I'm holding onto my old Legacy GT until it finally croaks. The trade-in value I was offered against an STI was a joke, about the same as a Corolla the same age (2008) would have, so despite Subaru's crowing they have the best retained value, they don't actually acknowledge it themselves. $7K on a mint vehicle with only 65,000 miles? Best used car value I could find by far, so I kept it.